Model 602A came first, and its tube complement is 12BA7 mixer/oscillator, 12BA6 1st IF, 12BA6 2nd IF, 12S8GT detector and first audio, 35B5 audio output, 35W4 rectifier. Model 602B keeps the same tube lineup, but adds cathode degeneration in the form of un-bypassed cathode resistors in the two IF amplifier stages. Model 602C removes the cathode resistors, reverting back to model 602A's circuit for the two IF amplifier stages, and adds an RF amplifier stage (a 6BJ6 tube). Tube complement: 12BE6 mixer/oscillator, 12BA6 IF, 12AT6 detector, 50B5 audio output, 35W4 rectifier. Only two screws fasten the chassis to the case. There's no cardboard back, separate from the antenna. A single piece of fiberboard serves both as a loop antenna support and the radio's back. In most radios that use a dial cord, it rides on tiny rollers, or pulleys. In this design, the pulleys were eliminated, and the dial cord rubs over fixed shafts and wire hooks. Not the way to get smooth tuning knob action. The parts count under the chassis is very low. This chassis design uses only three paper capacitors; six or more is the norm for five-tube AC/DC sets. The result is a truly "local reception only" design that is the very definition of the word mediocre. I bet the engineer won an employee award. 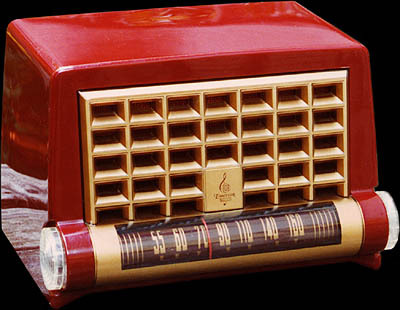 Both models are approximately 9-1/4 inches / 235 mm wide, including the knobs on the sides. 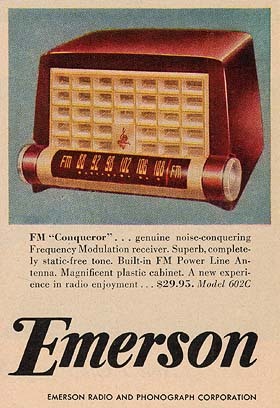 From a December 1949 magazine advertisement for the FM-only model 602C "Conqueror."